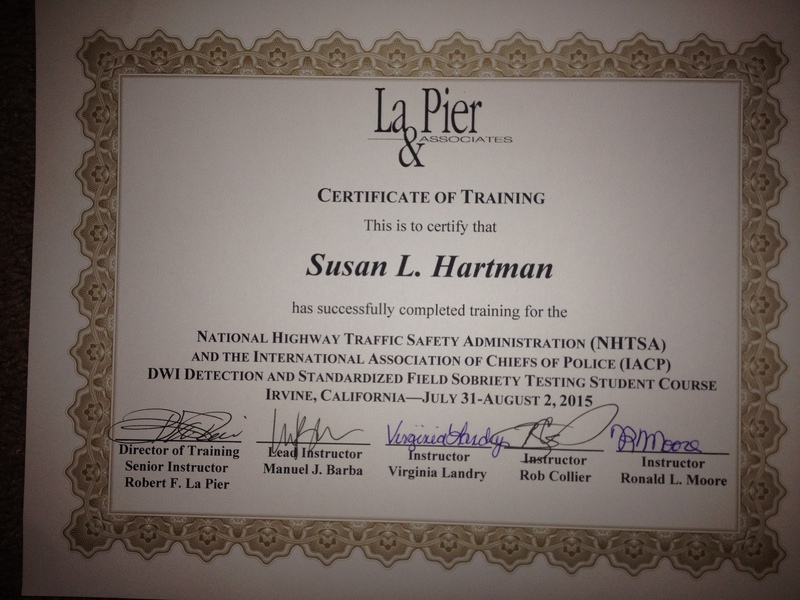 San Diego DUI defense attorney, Susan Hartman, of the Law Offices of Susan L. Hartman, recently attended The National Highway Traffic Safety Administration (NHTSA) and The International Association of Chiefs of Police (ICAP) approved DWI Detection and Standardized Field Sobriety Testing Practitioner Course, as presented by Mr. Robert La Pier. This is the very course law enforcement is trained in for DUI investigations, giving them the tools to determine if a person should be arrested for drunk driving. During the training, which lasted three full days, Susan was tested through written exams and practical demonstrations. In the end, she passed the course and earned the certificate of completion. According to NHTSA, there are only three standardized field sobriety tests (SFST’s): 1.) The horizontal gaze nystagmus; 2.) The walk and turn; and 3.) The one leg stand. These are the only tests that have been validated by NHTSA and should be used by law enforcement in evaluating each potential DUI. It should be noted that these tests were only validated to correlate to a specific blood alcohol content (BAC) and they are not be used to show impairment. In this blog article, the horizontal gaze nystagmus, or HGN, will be discussed. The other two tests will be addressed in upcoming blog articles. Nystagmus is the involuntary jerking of the eyes. HGN is the involuntary jerking of the eyes, occurring as the eyes gaze to the side. Because this movement is involuntary, people are usually unaware of the jerking and they are not able to control it or stop it from happening. According to the most recent studies, HGN is the most reliable of the tests to determine if a person’s BAC is at or above a .08%. This test was found to be 88% accurate, which means it is inaccurate 12% of the time. The earlier NHTSA study reported the HGN to be 77% accurate and 23% inaccurate in determining if a person is at or above a .10 BAC. To my knowledge, NHTSA has never addressed the discrepancy of the results of these studies. Nystagmus can be caused by factors other than alcohol. Therefore, before starting the test, the officer should ask the subject if they have any medical issues with their eyes. Next the officer should instruct the subject to keep their feet together, their hands by their sides and their head still. They are to look at the stimulus, pen or finger, with their eyes only. They are to follow the stimulus until told the test is over. The officer should then place the stimulus 12-15 inches from the person’s nose and slightly above eye level to open the eye. The officer then looks to see if the person has resting nystagmus and equal pupil size. Then the officer is to check for equal tracking by moving the stimulus to the subject’s left for a two-second count and then back to the center and continuing to the other side to check the right eye for another two-second count. This is repeated a second time for each eye for each of the clues below. Next, the officer checks for lack of “smooth pursuit,” using the same method as described above for equal tracking. The eyes are then checked for “distinct and sustained nystagmus at maximum deviation.” This means when the stimulus is held out to the eyes extreme for a four-second count, the jerkiness is distinct and sustained. Next is the “onset of nystagmus prior to 45 degrees.” For this portion, the cop continues to keep the stimulus 12-15 inches from the subject’s nose and then slowly moves it to the subject’s left until the stimulus reaches 45 degrees. The officer is looking to see if the jerking starts before the 45 degrees. In evaluating this test, one point or clue is noted for each of the following for each eye: 1.) Lack of smooth pursuit; 2.) Distinct and sustained nystagmus at maximum deviation; and 3.) Onset of nystagmus prior to 45 degrees. That is a total of 6 clues. If the test is performed properly and 4 or more clues are noted, it is likely the person’s BAC is at or above .08%. But remember, this is only 88% accurate. When an officer testifies, it often becomes apparent they did not follow NHTSA’s standardized procedures for conducting the test and evaluating the results. Without doing the test properly, the test results may not be accurate and your case can be impacted in your favor. If you have been charged with drunk driving in San Diego County, you owe it to yourself to hire a DUI defense attorney who knows how to properly administer and evaluate the SFST’s and how the officers should be conducting themselves in the field when doing a DUI investigation. Contact the Law Offices of Susan L. Hartman today for your free phone consultation: (619) 260-1122.